U.S. private prisons incarcerated 128,063 people in 2016, representing 8.5% of the total state and federal prison population. Private prisons in the United States incarcerated 128,063 people in 2016, representing 8.5% of the total state and federal prison population. Since 2000, the number of people housed in private prisons has increased 47%. 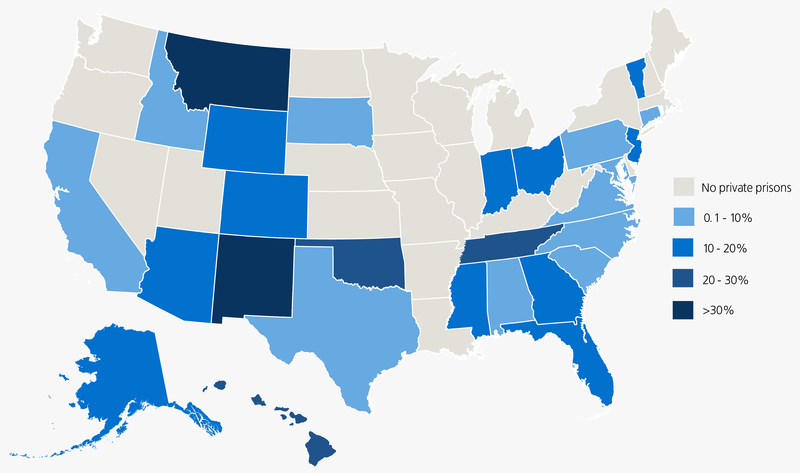 States show significant variation in their use of private correctional facilities. For example, New Mexico incarcerates over 40% of its prison population in private facilities, while 23 states do not employ any for-profit prisons. Data compiled by the Bureau of Justice Statistics (BJS) and interviews with corrections officials find that in 2016, 27 states and the federal government incarcerated people in private facilities run by corporations including GEO Group, Core Civic (formerly Corrections Corporation of America), and Management and Training Corporation. According to BJS data, 19 of the states with private prison contracts incarcerate more than 500 people in for-profit prisons. Texas, the first state to adopt private prisons in 1985, incarcerated the largest number of people under state jurisdiction, 13,692. Since 2000, the number of people in private prisons has increased 47%, compared to an overall rise in the prison population of 9%. In six states, the private prison population has more than doubled during this period. The federal prison system experienced a 120% increase in use of private prisons since 2000, reaching 34,159 people in private facilities in 2016. Among the immigrant detention population, 26,249 people – 73% of the detained population – were confined in privately run facilities in 2017. The private immigrant population grew 442% since 2002. The private prison population reached its peak in 2012 with 137,220 people. The population then declined for three years before increasing again in 2016. At the federal level, a 2016 Obama Administration policy shift to reduce reliance and ultimately phase out private prison contracts was reversed by Attorney General Jeff Sessions in February 2017. The reversal took place despite significant declines in the federal prison population and a scathing report by the Justice Department’s Office of the Inspector General that found federally contracted prisons had more safety and security incidents than public prisons. Currently, the federal Bureau of Prisons maintains the nation’s highest number of people managed under private prison custody. Changes in policy at the Department of Justice in 2017 that are likely to increase sentence length and expand prosecutions for drug and immigration offenses may contribute to the expansion of private facility contracting. Sources: Prisoners Series (2016, 2000), Bureau of Justice Statistics, Department of Justice, Washington, D.C. Interviews with North Dakota and Oregon corrections officials. Data of average daily immigrant detention numbers obtained from Immigration and Custom Enforcement and Removal Operations division by Detention Watch Network and the Center for Constitutional Rights as part of a Freedom of Information Act lawsuit.